Vivian Vance (born Vivian Roberta Jones; July 26, 1909 – August 17, 1979) was an American television and theater actress and singer. Vance is best known for her role as Ethel Mertz, sidekick to Lucille Ball on the American television sitcom I Love Lucy, and as Vivian Bagley on The Lucy Show. Vance was born Vivian Roberta Jones around July 26, 1909, in Cherryvale, Kansas, the second of Robert Andrew, Sr. and Euphemia Mae (Ragan) Jones’ six children. When she was six years old, her family moved to Independence, Kansas, where she eventually began her dramatic studies at Independence High School with drama instructor Anna Ingleman. Her love of acting clashed with her mother’s strict religious beliefs. “Viv” soon rebelled, often sneaking out of her bedroom and staying out after curfew. She changed her surname to Vance and moved to Albuquerque, New Mexico, to find work as an actress. Vance performed in the very first show at the Albuquerque Little Theatre in 1930. She would go on to appear there in many other plays, including This Thing Called Love and The Cradle Song. The local theatre community helped pay her way to New York City to study under Eva Le Gallienne. Starting in 1932, Vance was in a number of shows on Broadway, usually as a member of the chorus. Eventually she graduated to supporting parts after she replaced Kay Thompson in the musical Hooray for What! (1937). Her most successful stage role was that of Nancy Collister in the Cole Porter musical Let’s Face It! (1941), in which she starred alongside Danny Kaye and Eve Arden for over 500 performances. Following her appearance in a revival of The Cradle Will Rock in 1947, Vance decided to move to California to pursue other theatre projects as well as opportunities in film. During her stay in Los Angeles, Vance appeared in two films: as streetwise chambermaid Leah in The Secret Fury (1950), and as Alicia in The Blue Veil (1951). She received several positive notices for her performances, but the films did little else to further her screen career. When Desi Arnaz and Lucille Ball were casting their new television sitcom I Love Lucy in 1951, director Marc Daniels, who had previously worked with Vance in a theater production, suggested her for the role of landlady Ethel Mertz. Lucille Ball had wanted either Bea Benaderet or Barbara Pepper, both close friends, to play the role. CBS refused Pepper on the grounds that she had a drinking problem, and Benaderet was already playing Blanche Morton on The George Burns and Gracie Allen Show. Arnaz then began searching for another actress and Daniels took him and producer Jess Oppenheimer to the La Jolla Playhouse to see Vance in the John Van Druten play The Voice of the Turtle. Watching her perform, Arnaz was convinced he had found the ideal actress to play Ethel Mertz. Ball was less sure. She had envisioned Ethel to be much older and less attractive; Vance was closer to Ball’s age and attractive. Also, Ball, firmly entrenched in film and radio, had never heard of Vance, who was primarily a theater actress. Ultimately, the 42-year-old Vance won the role on the new television program, which debuted October 15, 1951, on CBS. Vance’s Ethel Mertz character was the landlady of a New York City brownstone that she and her husband Fred owned on East 68th Street. The Fred role was played by William Frawley, who was actually 22 years her senior. Despite their exceptional chemistry, comedic timing, and musical prowess together onscreen, Vance and Frawley did not get along offscreen. According to some reports, things first went sour when Frawley overheard Vance complaining about his age, stating that he should be playing her father instead of her husband. She used to skim through the script before she memorized her lines to see how many scenes she had with “that stubborn-headed little Irishman.” Others recall that they practically loathed each other on sight and that Vance was put off by Frawley’s cantankerous attitude. Honored for her work in 1953, Vance became the first actress to win an Emmy Award for Outstanding Supporting Actress; she accepted her award at the Emmy ceremony in February 1954. She was nominated an additional three times (for 1954, 1956, and 1957) before the series ended. In 1957, after the highly successful half-hour I Love Lucy episodes had ended, Vance continued playing Ethel Mertz on a series of hour-long specials titled The Lucille Ball-Desi Arnaz Show (later retitled The Lucy-Desi Comedy Hour). In 1959, she divorced her third husband, Philip Ober, who allegedly physically abused her. When I Love Lucy was reformatted into the hour-long Lucy-Desi shows in 1957, Desi Arnaz offered Vance and Frawley the opportunity to star in their own “Fred and Ethel” spin-off show. Although Frawley was very interested, Vance declined, mainly because she did not want to work on a one-on-one basis with Frawley as they already did not get along. Also, she felt the Mertz characters would be unsuccessful in a show without the Ricardos. Vance’s choice to decline the would-be show intensified the animosity between her and Frawley. Instead, Vance was interested in doing a series based on the life of Babs Hooten, a New York socialite who moves to New Mexico to run a hotel and ranch. Desi Arnaz financed a pilot starring Vance as Hooten titled Guestward, Ho!, which was shot in 1958 by Desilu; however, the show was rejected by CBS and Vance continued playing Ethel Mertz. Arnaz would later retool the show with model and actress Joanne Dru taking the lead role, selling the series to ABC, where it was subsequently cancelled after one season. On January 16, 1961, Vance married literary agent, editor, and publisher John Dodds (1922 – October 9, 1986). The couple established their home in Stamford, Connecticut, although they moved to California in 1974; the marriage lasted until Vance’s death. In 1962, Lucille Ball was planning to return to television in a new series, The Lucy Show. The series starred Ball as Lucy Carmichael, a widow with two children living in Danfield, New York. Vance reluctantly agreed to be her co-star on the condition that she be allowed to appear in more glamorous clothes as well as having her character be named “Vivian”. By this time in her life, Vance had grown tired of the public addressing her as “Ethel”. She appeared on The Lucy Show from 1962 to 1965, as Vivian Bagley, a divorced mother of one son, sharing a house with Ball’s character. The character was the first divorcee ever on a weekly American television series. In the third season, Vance did not appear in seven of the season’s 26 episodes. Vance was growing tired of commuting weekly between her home on the East Coast and Los Angeles. Vance’s working relationship with Ball was also becoming strained. At the conclusion of the third season, Vance requested a new contract giving her more creative control with the opportunity to produce and direct episodes and better pay if she were to continue commuting for the show. Agents and studio executives misinformed Ball regarding Vance’s desires believing she wanted to be Ball’s equal. It was decided not to meet Vance’s requests. Both Ball and Vance felt betrayed by the other and Vance left the series. Ball would later regret not giving Vance what she requested. Without Vance on the show, Ball seriously considered ending the series, feeling she couldn’t continue without her. Vance made three more guest appearances on the remaining seasons of The Lucy Show. Following her departure from The Lucy Show at the end of the third season, Vance signed on to appear in a Blake Edwards film, The Great Race; she saw this as an opportunity to restart a movie career, which never really took off. The film was a moderate success, receiving several Academy Award nominations; however, it did little to help her establish a career as a movie actress. Vance was slated to make her return to Broadway in the Woody Allen comedy Don’t Drink the Water. However, she left the play during its out-of-town tryouts, later saying she felt the role was not right for her and asking the show’s producers to be let out of her contract. Vance would end up making her Broadway return several years later in 1969 in the comedy My Daughter, Your Son. However, the show was not a success and lasted only five weeks. A national tour proved to be more successful. After her departure from The Lucy Show, Vance appeared occasionally alongside Ball on reunion shows and made several guest appearances on Ball’s third sitcom, Here’s Lucy (1968–1974). In 1973, she was diagnosed with breast cancer. The following year, she and her husband moved to Belvedere, California, so she could be near her sister. It was during this period that Vance’s agent got her an endorsement deal with Maxwell House Coffee. Over the next several years, she could be seen in numerous commercials for Maxwell House. Vance made a number of TV guest appearances in the 1970s, including a well-remembered 1975 episode of Rhoda, as well as appearing in a number of made-for-TV movies including The Front Page (1970), Getting Away From it All (1972), and The Great Houdini (1976). She and Ball appeared together one last time in the 1977 CBS special Lucy Calls the President. Vance made her final television appearance with Lucille Ball on the CBS special Lucy Calls the President, which aired November 21, 1977. That same year, she suffered a stroke that left her partially paralyzed. Star on the Hollywood Walk of Fame at 7030 Hollywood Boulevard. I find that now I usually spend my time looking at Viv. Viv was sensational. And back then, there were things I had to do — I was in the projection room for some reason — and I just couldn’t concentrate on it. But now I can. And I enjoy every move that Viv made. She was something. 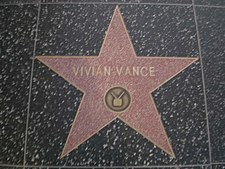 For her achievements in the field of television, Vance was posthumously awarded a star on the Hollywood Walk of Fame in 1991 at 7030 Hollywood Boulevard. Vance is memorialized in the Lucille Ball–Desi Arnaz Center in Jamestown, New York. On January 20, 2010, the San Francisco Chronicle reported that a local antique dealer had inherited many of Vance’s photos and scrapbooks and a manuscript of her unpublished autobiography when John Dodds died in 1986. Vance and Frawley were inducted into the Television Academy Hall of Fame in March 2012. Vance was the godmother of Lovin’ Spoonful guitarist John Sebastian, whose mother had been a close friend. Vance herself had no children. The story of how Vance was hired to play “Ethel Mertz” in I Love Lucy is told in I Love Lucy: A Funny Thing Happened on the Way to the Sitcom, a comedy that had its world premiere in Los Angeles on July 12, 2018. The play, from Gregg Oppenheimer (son of I Love Lucy creator-producer-head writer Jess Oppenheimer), was recorded in front of a live audience for nationwide public radio broadcast and online distribution. ^ a b Elisabeth Edwards (2008). ““I Love Lucy” Cast Biographies: Vivian Vance”. CBS. Archived from the original on February 23, 2008. Retrieved 2008-04-04. ^ “History”. Albuquerque Little Theatre. 2016-08-01. Retrieved 2016-10-11. ^ Karol, Michael (2004-01-04). Lucy A to Z: The Lucille Ball Encyclopedia. iUniverse. p. 56. ISBN 9780595752133. ^ Ken Severson (2008). “Biography for Bea Benaderet”. Internet Movie Database. Retrieved 2008-04-04. ^ Michael Karol (2006). “I Love Lucy”. Lucy A to Z. Retrieved 2008-04-04. ^ Mikkelson, Barbara and David (May 27, 2002). “Weighty Matters”. Snopes. Retrieved 2008-04-04. ^ frankfob2 [sic] (2008). “Biography for Philip Ober”. Internet Movie Database. Retrieved 2008-04-04. ^ Libby Pelham (25 March 2006). “I Really Love Lucy”. Families.com. Retrieved 2008-04-04. ^ “Awards for Vivian Vance”. Internet Movie Database. 2008. Retrieved 2008-04-04. ^ “Vivian Vance Papers and Photos Found”. San Francisco Chronicle blogs. 19 January 2010. Retrieved 19 September 2014. ^ “I Love Lucy: A Funny Thing Happened on the Way to the Sitcom”. Broadway World. Retrieved July 16, 2018.